We’d love your help. 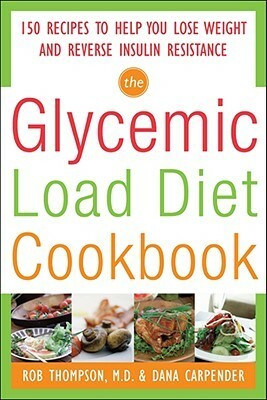 Let us know what’s wrong with this preview of The Glycemic-Load Diet Cookbook by Rob Thompson. To ask other readers questions about The Glycemic-Load Diet Cookbook, please sign up. bit disappointed with this, quite concerned with the amount of spend a used in this book which is as far as I'm concerned a million times worse than a baked potato, whatever the gl of of it is. But then I suppose it doesn't say healthy it says low GL. It just goes to show that because something is low sugar or low something it doesn't mean it's healthy. I've come away from this book and another I recently read by Robert Lustig called fat chance, with the knowledge that if it's not from a natural bit disappointed with this, quite concerned with the amount of spend a used in this book which is as far as I'm concerned a million times worse than a baked potato, whatever the gl of of it is. I've come away from this book and another I recently read by Robert Lustig called fat chance, with the knowledge that if it's not from a natural source, (excluding sugar) earth or animal etc you really shouldn't be sticking it in your mouth! and make everything you possibly can from scratch then you know what's in it, I look at my grand parents 90 years old, bought up on mostly fat some meat and veg and minimal fruit (difficult to come by as was expensive) and they are still active (and smoking - argh! 35 a day?!) and living a full life. Some outdated nutritional info, but the recipes are most disappointing. She writes about artificial sweeteners being helpful for some people, but then then the recipes are full of the stuff, with no substitutions for those of us that don’t want or need them. This book has some delicious-looking recipes that are sure to help me on my Journey to Not Eat Out For Every Meal. And I'm happily excited that they will also help me manage weight and blood sugar levels. The book does have a bit of an element of THIS IS HOW YOU SHOULD EAT AND YOU CAN NEVER EAT ANYTHING ELSE like most diet books, so remember to take it with a grain of salt and go with your intuition. It's also a fun read. The only good thing for me is that some of the recipes I can eat/modify for my vegetarian needs. I do believe in moderation, and I think that this book is a little extreme for me. It's a combo of Paleo and Atkins. So that might be up your alley. My DR told me that eating less sugar will help with my Hypothyroidism, so that is the only reason I read this. It was more of a miss than a hit for me. I jotted down some of the recipes and I'm going to try them. I checked this out of the library hoping to add some new recipes to my repertoire, but there was WAY too much use of artificial sweeteners. To each his own, but I was hoping to see "real" foods used in creative ways; not zero calorie subs in run of the mill recipes. Good explanations about how starches affect our bodies. Also, includes ideas for restaurant eating by category, so you can stay on track. It's good to recognize the difference between the glycemic index and the glycemic load, which is mostly about portion size. I did copy some of the recipes to try. This book is chock full of easy to make recipes. Everything I have tried is delicious and even my meat loving DH happily ate everything. the recipes were not that helpful, but the information was very good.